I know, Thanksgiving is over and no one wants to look at another scoop of stuffing or turkey slice or plop of cranberry sauce until next year. Everyone except me! I love Thanksgiving. We had a great time. My mom and sisters and a friend all came over and I cooked a giant turkey, way bigger than we needed for the six of us. This post is a little delayed because my computer crashed and I bought a new one online on Thursday (did you know a lot of electronics stores start their black Friday online sales on Thursday?) and it arrived yesterday, but I had to set it up and play with it and catch up to all the internet things I'd missed in a week. New computers are so fast and shiny! I love it. It's a Toshiba of some sort. 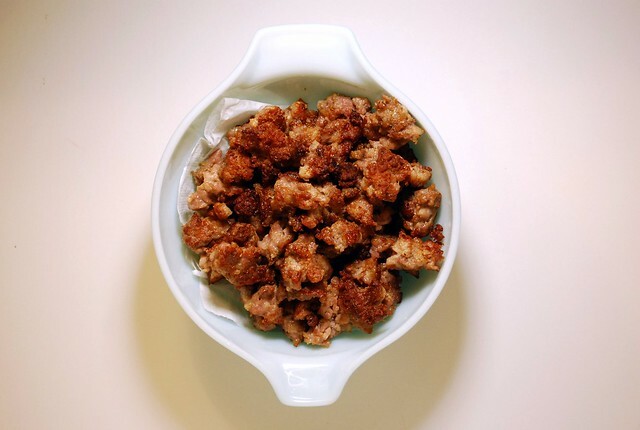 Back to this stuffing recipe. 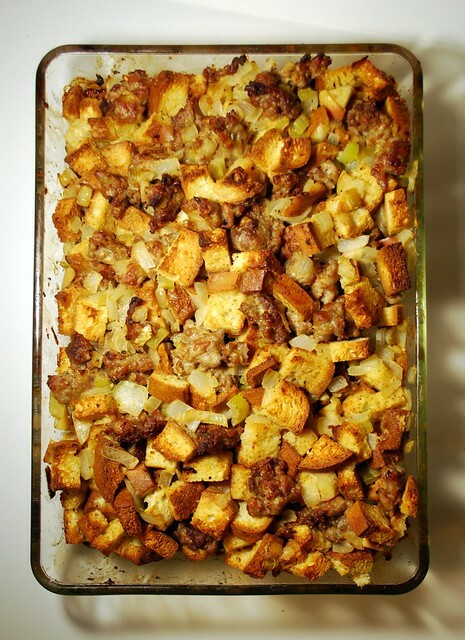 I found it on Epicurious, and it claims to be the stuffing of your dreams. Obviously I had to test that, and they're right. 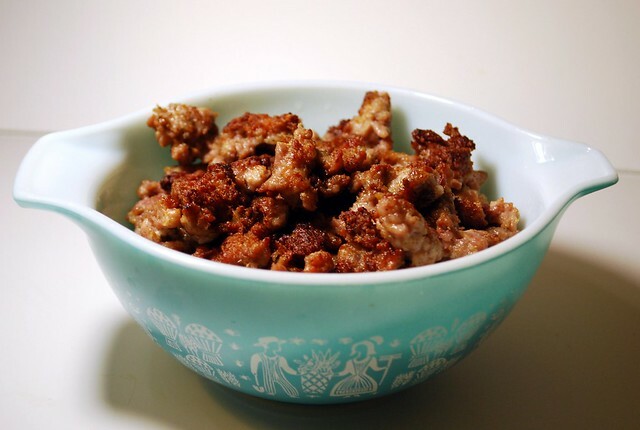 It's a dreamy stuffing. Butter, cream, sausage, garlic, parmesan cheese, etc. These photos are from when I remade it, to eat with the rest of the turkey we have. It's not too involved to make, cook some sausage and some veggies and mix up some liquid and stir it all together and bake it. Oh and drizzle it with some cream if you want right before you bake it. Seriously. Preheat your oven to 350. Chop up your gf bread into cubes, then spread onto a cookie sheet and toast until crispy. Turn the heat up to 425 if you plan to bake the stuffing now. Heat up the olive oil in a large pan over medium heat, then break up half of the sausage into the pan and cook until well browned and delicious. Remove to a bowl with a paper towel in the bottom to drain the fat. Cook the rest of the sausage as well. Wipe out the grease from the pan, then melt the butter. Cook the onions, garlic, paprika and celery together until softened. Combine the sausage, bread, and vegetables. Whisk together the eggs and 1/2 c of cream and cheese and stock. Stir in the liquid and spread into a glass baking dish (your largest). Drizzle the rest of the cream over the top and cover with foil. Bake for 20 minutes until heated through, then remove the foil and bake another 20, until crispy and lightly browned. Makes about a million servings, and can be made a day or two ahead if you keep it in the fridge, just bring to room temp before baking. *I use Food for Life brown rice bread. Their breads are pretty crappy for eating, but great for things like breadcrumbs and stuffing. Soft breads like Udi's tend to get all soggy if you don't crisp them up enough. I hope you all had a good Thanksgiving, and here is a picture of my puppy. YUM - fab recipe... going to keep that! 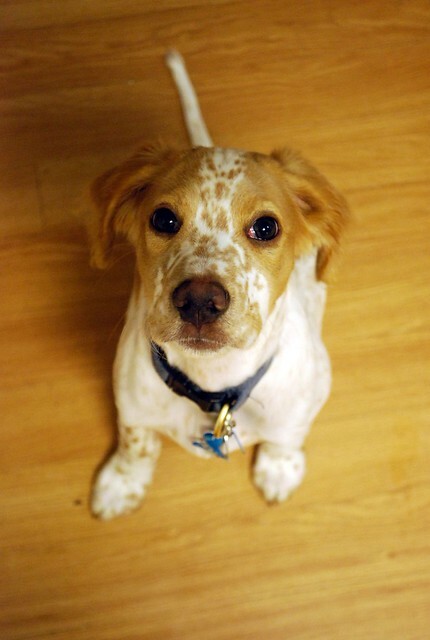 your puppy is THE CUTEST. 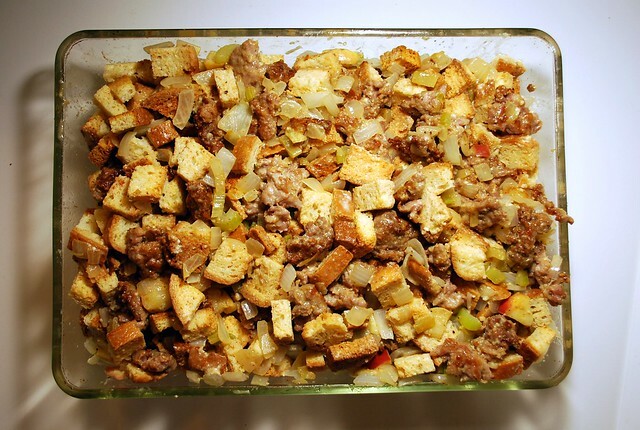 I made the stuffing for our early Christmas meal last weekend. It was very tasty despite the fact that I left out the sausage (stupid), though I did replace it with pecans (yum!). Next time I'll put in the sausage AND the pecans.